Some of the major companies in cell separation technologies market comprise Mitenyi Biotec GmbH, EMD Millipore, STEMCELL Technologies, BD Bioscience, pluriSelect GmbH, Terumo BCT, and Thermo Fisher Scientific, Inc. These players are claimed to drive the growth of cell separation technologies market in the years to come. 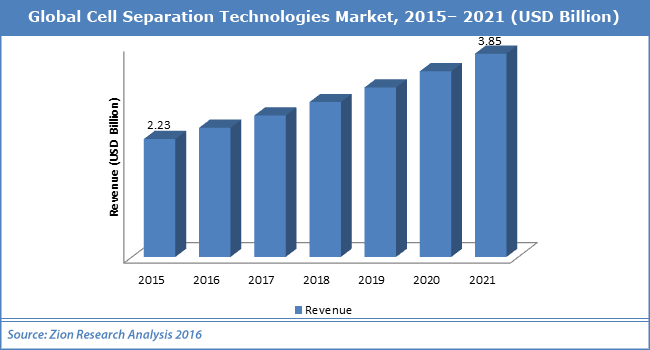 As per analysts at Zion Market Research, the global cell separation technologies market was capitalized at almost USD 2.23 Billion in 2015 and is likely to cross approximately USD 3.82 Billion by end of 2021, developing at a CAGR of almost 9.5% from 2016 to 2021. As per analysts at Zion Market Research, the cell separation technologies market is likely to see noteworthy development in the coming years. The cell separation technologies market is mainly boosted by increasing aging population paired with rising occurrence of chronic diseases like cancer. In addition to this, strong growth in research & development activities aiming at cell therapies and rising government support are likely to power the development of cell separation technologies market in the years to come. For instance, in March 2018, new research was initiated in cell separation technologies by three companies namely Miltenyi Biotec (Germany), Stem Cell Technologies (Canada), and Thermo Fisher (Dynal brand), boosting the cell separation technologies market. On the other hand, the huge cost of cell separation equipments is likely to cause a threat to the growth of the cell separation technologies market in the years to come. Nevertheless, the significant tech advancements over the past few years and their acceptance in the healthcare industry are likely to act as fresh opportunity for growth of cell separation technologies market in the years to come. In terms of topography, the cell separation technologies market is divided into Asia Pacific, North America, Latin America, Europe, and the Middle East & Africa. North America ruled the cell separation technologies market with the biggest share of the market due to increasing R&D activities paired with the high spending in the healthcare industry. In terms of income, North America was closely chased in cell separation technologies market in 2015 by Europe. Europe held lucrative share in terms of income in 2015 in the cell separation technologies market due to different in-progress research & development initiatives. On the other hand, Asia-Pacific is planned to see the fastest development in the coming years on account of the rising demand for the R&D projects and developing nations’ status in the global cell separation technologies market.